^ Calvan, Bobby Caina. 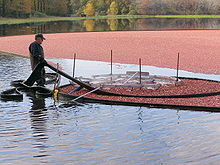 "Cranberry industry seeks to avoid school ban." Boston Globe, 25 June 2012. ^ Howell AB (October 2013). “Updated systematic review suggests that cranberry juice is not effective at preventing urinary tract infection”. Evid Based Nurs 16 (4): 113–4. doi:10.1136/eb-2012-101163. PMID 23604365. https://ebn.bmj.com/content/16/4/113.long.